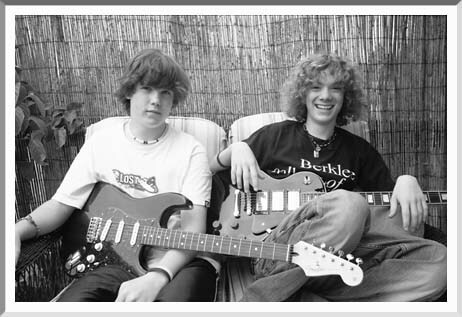 Good friends since kindergarten at Willard School, Jason Waldrip and River Donaghey have also played music together since sixth grade at Roosevelt. Both were featured on guitar when their band, The Tunnel Kings, played recently at Cozmic Pizza. "Our school talent show was embarrassing -- we had technical difficulties," Waldrip admits. "The microphone shocked me on the lips," explains singer-songwriter Donaghey. The pair of 14-year-olds got their start in politics last year when they volunteered for the Kerry campaign. "My dad is really into politics," says Waldrip. He and Donaghey skipped their middle-school graduation ceremony last month to take part instead in the Walk for Truth, Justice, and Community, sponsored by the Rural Organizing Project. ROP supports local human-dignity groups in rural Oregon. "My mom was on the peace march from LA to DC in '86," says Donaghey. "She found this one on the internet." Donaghey and Waldrip were among a core group of 100 who walked the entire five-day route from Salem to Portland, attending rallies and camping overnight along the way. Learn more at rop.org.